The widow of Moshe Nahari, who was murdered for being Jewish, has made aliyah to Israel along with four of her children. 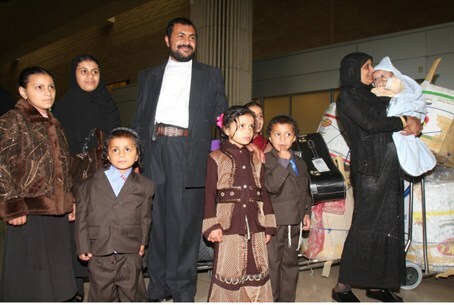 The widow of Moshe Nahari, who was murdered in Yemen four years ago, has made aliyah (immigrated) to Israel along with four of her children. The family was assisted by the Jewish Agency. Moshe Nahari, a Torah teacher, was shot and murdered by a Muslim man in the city of Reida. His murderer shouted, “Jews, receive the message of Islam” before opening fire. The killer was later sentenced to death. Five of Nahari’s children came to Israel shortly after the slaying. Now they will be reunited with their mother and four siblings. Just a few weeks ago the Jewish Agency helped the family of Aharon Zindani come to Israel. Zindani, like Nahari, was a Jewish leader in Yemen who was murdered, and was apparently targeted due to his Jewishness. Zindani’s murder raised fears for the fate of the tiny Jewish community that remains in Yemen.